This note is mistaken since it fails to highlight that the the teacher’s union protesting the reforms is a radical, Leninist splinter faction that represents at the most 10% of the main teachers union, and that it has never been “symbiotic with the PRI. The PRI’s reforms still has the support of 90% of the teachers. It also fails to say that the protest against energy reform led by demagogue López Obrador on Sunday only gathered 20 thousand supporters, a clear failure compared to the hundreds of thousands he used to get in the past. Thank you, Manuel, for the comment. I am not sufficiently well informed about the teachers’ union to be able to opine, though the passages in our post that referred to the need for extensive reform of the educational system came partly from me. As you know, Mexico lags in just about every indicator of educational performance. This is a terrible drag on economic development, and EPN’s push for reforms is a long overdue attempt to address the problem. I had heard that the Sunday protest was less well attended than anticipated. My sense is that the energy reform, which strikes me as very well balanced and conducive to an urgently needed modernization of the energy sector, has very good prospects for success. That is in part because opponents’ claims that it is outright privatization are simply not accurate, and in my view are unlikely to carry the day in the court of public opinion. 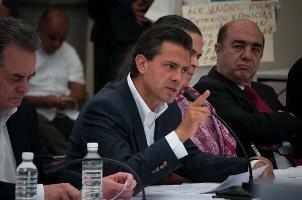 AMLO no doubt will continue to demagogue the issue, but it will only further seal his irrelevance.